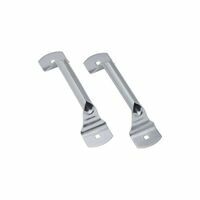 National Hardware Door Roller, Series: V7603, Standard, 1-3/4 in Roller Diameter, 0.31 in Roller Width, 4 in Overall Length, Plain Steel, 7/16 in Shaft National Hardware Door Hinge, High, 7-3/8 in Overall Length, 14 ga Steel, Galvanized, BHMA A138.1, NO 2, For Metal and Wood Garage Doors Used on side by side hinge placements for added strength. Factory lubricated, steel inner race with 10 ball bearings. Roller 1-7/8" O.D. Factory lubricated, steel inner race. Fits 2" standard J-track. Roller 1-7/8" O.D. Used on both wood and metal doors. Heavy-duty galvanized steel construction. Adjustable roller plate. Accepts a standard 7/16"OD stem roller. Includes four 1/4"-20 x 1-7/8" pancake head carriage bolts with nuts. Used by most garage door manufacturers. Roller tube accepts a standard 7/16"OD stem roller. Made of 14 gauge galvanized steel, 3"W overall. Includes four 1/4"-20 x 1-7/8" pancake head carriage bolts with nuts. National Hardware Swivel Lock, Series: V7645, Suitable For Use With: 5/16 x 5/16 in Shaft, Steel, Zinc Plated, For Garage Door National Hardware Door Roller, Series: V7602, Heavy Duty, Suitable For Use With: Residential Garage Doors, 1-7/8 in Roller Diameter, 10 Ball Bearing, 4-3/8 in Overall Length, Plain Steel, 7/16 in Shaft Short stem heavy-duty roller with steel inner race; 10 ball bearings. Contents: 2 roller assemblies. Roller 1-7/8" O.D.